In July, at a well known and very large show called Artscape in Baltimore, Maryland, USA, my daughter Juliet and I had the pleasure of seeing Marcia Wilson and her art work in person. As in her art work, the poignant humor in Marcia's uninhibited words reveal so much about Marcia the artist and person, as well as about Marcia the child, that a departure from the usual format was called for in order to, in great part, let Marcia tell her own story. 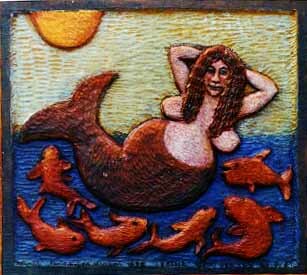 I like to do summer shows at the Jersey shore and LOTS of people ask me, "got any MERMAIDS?" Otherwise, I think they're kind of cute. It gives me a chance to do water and fish and a beautiful woman. Don't forget, I'm "stuck" in the late 40's and early 50's when I was most impressionable and magazines had lots of toothy girls grinning from the covers of Photoplay Magazine or the sides of buses advertising Palisades Amusement Park, which was about 4 miles from my home (in Leonia, New Jersey). Especially this chubby, content, voluptuous, and unabashed mermatron with the adoring fishes contemplating her beauty??? Well, that position of the arm behind the head is body language. I first noticed it on a painting by a man named Komiyama that I bought in the 1970's. He had a seascape with a little stick figure and I just loved that figure and guessed it had to be the position of the arms behind the head. It seems to be a relaxed and seductive pose. Again, it reminds me of many poses by movie stars or people advertising a product like toothpaste or shampoo in the 40's and 50's. "So I bought this tool. Right away I LOVED it." ...in about 1980, I was in a woodcarving show for some north Jersey carvers...and there was a table for a woodburning tool manned by Al Colaguori and his brother Steve. Al said his brother invented the tool that I believe was called "the Detailer" because Al was a carver and needed a better tool for burning feathers in birds. So I bought this tool. Right away I LOVED it. The bathing beauty in the yellow bikini above waving her whirligig arms thanks to air currents is what Marcia uses as her show-stopper: the eye catching piece that gets the attention of the passers-by. It's perched prominently on the top of the center display case towards the back of the booth and draws in the curious. Relief sculptures and some paintings on wood line the walls, while one large sculpture is near the front and some other good-sized wood sculptures are also in front encased in a display box. Since Marcia works so many shows, I asked her what the elements are that make a show successful for the seller. She cited: reasonable entry fee, lots of customers/people going through, a place to park her car, a "safe" environment, nice quality work from the other participants, enough sales so she doesn't LOSE money doing the show but can cover her booth fee and expenses. She added that motivational prizes were a plus, too. Finally she cited--as maybe the most important thing--the WEATHER. She said that "people will not come out in rain or wind or lightning or extreme heat or cold." She said that the show in Baltimore had more or less ideal weather, but that that is often not the case. Furthermore, Baltimore had live entertainment to draw the crowds, she noted, and added that only a tiny fraction of those people would come out for art alone. Marcia says that high entry fees keep people away. She recalled a folk art show in Virginia Beach where, depending on which day it was, the public had to pay either $12 or $6 to get in. She said, "Nobody came. We had about 300 people a day browsing. Most of us did extremely poorly." Many shows have rules about who can exhibit what, Marcia explained. 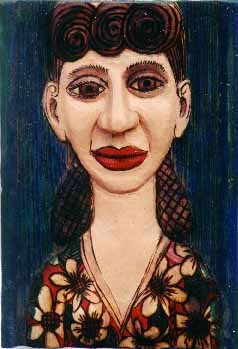 She got juried into Baltimore for WOOD, whereas another weekend at another show she got juried in for ETCHINGS. For this latter one she is not allowed to sell any WOOD or display it. She much prefers when the ARTIST gets juried in more than one type of work. Although she realizes there are reasons for those rules, she feels that often because of those restrictions, she has "gone home miserable after spending $300 to do a show and sell nothing...."
Regarding what kind of public are the ones who buy, Marcia said that it varies A LOT for each artist. For her work, her criteria are an intellectual public with money, who feel safe enough to stop and linger in her booth. She noted that in New York City, for example, she might be outside a subway, and, if the public does not feel "safe," they will rush right by and not stop. Maybe they feel pressured by time, or perhaps the location (in that case, Central Park) is not right. "I once did an Indian pow wow" she remembers, "where 10,000 people came looking for Indians, not me." "I also did an apple orchard where they were looking for fruit, not me." In terms of what amount of stock you should display and in what price ranges, Marcia says, "the low end should be $20 or less; the high end, whatever." She noticed that in one show, for example, she was next to a man who did very well selling ducks for $5. That sort of item is an "impulse" purchase that can be sold to people in a hurry. Marcia says she, on the other hand, needs people with a lot of leisure time, who will have time to spend in her booth. We concluded that the items in the low end of the price range represent the high volume sales and are the chief moneymakers, while the larger pieces are the ones that draw the crowds. "Well, I think of what will make me cry when I drive home. If it's too cheap, that's what happens. So I think very carefully when I reply." She followed that maxim with a story to illustrate: "Last night, a man called about another whirligig, and I said '$1800.' He was obviously put off by the price, so I said (rather rudely, I guess, although I said it in a soft voice), "So don't buy it, and we'll both be happy." By way of explanation, she continued, "That's because I'm thinking of all the shows I have yet to do like NEXT year's Baltimore when I'll need a "show-stopper" in my booth to draw people. I just think of what the piece is worth to me to replace it. So I think my prices are accurate. The way I price them, they should stay with me for at least a few years." In 1981, I was in a show in Morristown, New Jersey where one of my little queen boxes got stolen by a blonde woman and her dark-haired male friend. The blonde bought an inexpensive etching from me and stood between me and the man who swiped my little queen box from its shelf. Broke my heart. I had a lot of little woodburned boxes in that show. Do you find the shows or do they find you? I find them--word of mouth through friends. Was it difficult to do shows at first? Is it still? The art shows are difficult. They are hard work, especially now that I am getting older. But I enjoy doing them. And I persist because that is the only audience I know for my work. ...if I sell to galleries, I never meet the customers, but only see the gallery owner. I have watched many artists become gallery-owner junkies, addicted to the few drops of praise from the gallery owner, who has the nerve to often tell the artist what kind of pictures to paint, what kind of work to do. I never want to give another person that much power. "First, I will attach some arms. from twigs in my garden. Next I will paint it. Marcia does lots of pyroengraved relief carving. Her pyroengraving involves no shading, only outlining. She uses a router to get into the wood and finishes it up with gouges and knives and woodburning (she likes to burn really hot) and sanding and paint. I got the Colwood hot knife because it really gets hot. I like a veryyyyy hot tool so it works quickly. It comes with only one point. A replacement tip comes with its own handpiece and it cost me $40. So far I have replaced it once, but I'm still using the old one, which has curled with the heat. It curled almost immediately after I bought it. Not only does Marcia woodburn on clean wood, she sometimes burns over the paint, too. Up until some months ago, she generally used casein paint, but recently she has been using "rustoleum," an oil-based, enamel paint in cans that she buys from the hardware store. "I carve and woodburn and paint and woodburn and sand and stuff like that--all jumbled up. I am not an "orderly" carver." Why do you burn OVER paint, rather than the other way around? ...to clean up my work. When I paint, the black lines get filled. If I want them open again, I woodburn again. Are you not concerned with possible toxicity? Oh. Never thought of that. Yes, of course, there must be toxicity. Oh well. Too late. Kimona was named after the fact, because that's what her dress looked like, what little of it is showing. It is made from a door from a cabinet I found in the trash in my home town of Leonia. I like to make things out of trash. I glued three extra pieces on this board: for the nose and two breasts. Then I carved her with a rotary rasp attached to an air compressor, followed by sandpaper on a dremel tool, followed by extensive woodburning and knife work, followed by gouge work with a vee tool on the background, followed by oil base enamels from little cans in the hardware store. Her hairdo is from the 1940's where I seem to be "stuck" in my memory of lovely ladies, wearing snoods and hairnets and permanent waves. Do you work exclusively on one type of wood, or do you have a preferred wood even if you work on various types? Nah. I like basswood and pine and black walnut and mahogany. Any will do. I also like cheapo wood like hemlock and 2x4's. I like whatever is in front of me, the right size and thickness. Whatever is "calling" my name. How do you finish your pieces to prevent fading and to protect them? Gee. Never thought of that. The painted ones have no finish. The raw wood ones have that minwax tung oil finish on them. That's all. I had begun carving 13 years before I learned whittling from an "adult ed" course at the Ridgewood High School. It was taught by Henry Imp. I phoned him ahead of time and said I wanted to do my own stuff and not follow his instructions. He said,"What do you mean?" And I said,"I do not want to carve 'blanks.'" So, class #1, Henry gave the class blanks to carve whales, and I got a blank piece of basswood and carved a man with a hat and his tongue sticking out, and I guess that pretty much sums me up from then on out. The tongue was a mistake, as I recall, but I always incorporate mistakes into my carvings. Or at least I used to. 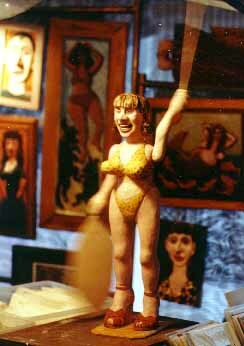 Now I sometimes amputate like a breast that was too small, and I add a new piece of wood for enhancement. Or I guess what you call breast enlargement now. By the way, Henry Imp never did like my "disobedience." 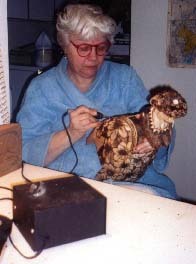 I carved quite a few things and had a show in the Leonia Public Library at that time. Henry went to see it. He came back to the class and asked, "Has anybody seen Marcia's show at the library?" A woman named Dottie said she had. "Isn't Marcia's work ugly????" asked Henry. Needless to say, I did not stay in Henry's class long after that. However, on the subject of ugliness, I must say that it is my most important freedom. If I had to make only "beautiful" things, why I would feel very burdened indeed. I cherish my freedom to embrace everything that comes from my tools. Good, bad, and ugly. That way every project is very relaxing. Click here for conclusion next page.